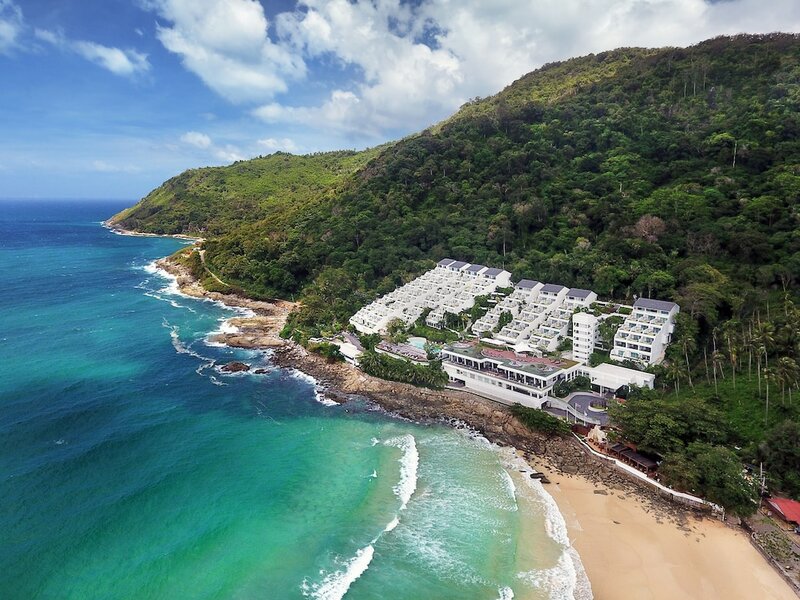 Nai Harn beach is one of the most beautiful beaches in Phuket with its excellent water quality. It's encompassed on both sides by jungle-covered mountains and there's a large freshwater lagoon inland. Never overloaded, even in high season, Nai Harn's usually busier at weekends as it is popular with both Thais and expats. Many tourists who come to Phuket never make it to this wonderful stretch of sand. At the southern end the lagoon flows into the sea, creating a stream that children love to play in. All year round the water is a comfortable 29°C. Flat lake-like crystal-clear water invites you for a dip November to May. From June to October during the southwest monsoon period swells arise with rip tides. You should never go into the water when red warning flags are flying. Small beach umbrellas and mats are available from nearby local stores. There are public toilets at the north end by the shops and the centrally located beach restaurants will usually allow you to use theirs for a small charge. A large majority of the restaurants installed under the trees at the top of the beach have been removed. It is yet still possible to order sandwiches, ice creams, cut fruit and a range of drinks that includes beer, soft drinks and juices directly from the beach to ambulant vendors, so you don't even have to interrupt your tanning. The few restaurants that could avoid the demolition are very reasonably priced and have menus that seem to go on forever. Pretty much any Thai dish you could want will be available in addition to many international favourites. Some of the best snorkeling in Phuket can be found in front of The Nai Harn Resort. Snorkeling opportunities stretch all the way out past Ao Sane (a small beach to the end of the bay). Equipment can be rented easily on the beach or bought at the nearby shops. From May to October at the northern end of the beach, the waves are a little small for surfing but the perfect size for boogie boarding. Kids love to spend the whole day riding the waves in a relatively safe environment and it doesn't take long to learn. Boards can be bought in the shops around Nai Harn Beach or rented from the sunbed rental people. Although generally quieter than the other beaches in Phuket, rental jetskis do make an appearance from time to time. At the south end of this beach there is a permanent sandbank that gives a good and often fast ride, even in the smallest swells. At the northern end (right next to The Nai Harn) there is a beach-and-reef break in the corner. This break can hold large swells and can at times get pretty potent. Winds are variable with waves up to three metres.